Did Gene Star in Any Non-Musical Pictures? Did Gene Kelly Star in Any Non-Musical Pictures? Screenshot from the trailer to Inherit the Wind, Wikimedia Commons. Yes, Gene Kelly stars in many non-musical pictures. He may be most widely known as a song-and-dance man, but his "straight pictures" (i.e., no singing or dancing) are just about as numerous. In total, not counting the TV productions, he stars in 14 non-musical pictures. Part of why the studio commissioned Gene to star in non-musical pictures was to get its money’s worth out of him. It made no economic sense to pay a star if s/he had no work to do. There was not always a musical available for Gene and, besides, he also found value in straight pictures. The title Christmas Holiday suggests a cheery film with Gene “rockin’ around a Christmas tree,” but don’t be fooled. This is, instead, a film noir co-starring Deanna Durbin, who plays as much against type here as Gene. This is the only film in which the music stops when Gene steps onto the dance floor. Gene brings much life to Living in a Big Way. In terms of being a non-musical, it is confusing: there are a couple of musical numbers, but the film is not considered an outright musical. The first number features Gene dancing with his leading lady, Marie McDonald. Gene also dances with both a dog and a statue (yes, a statue) in the second number. The third number, an addition to the picture, is considered the highlight of the film: Gene joins a group of children on a construction site and performs stunts usually reserved for acrobats. Marjorie Morningstar features Natalie Wood as Gene’s leading lady. The film is about a summer romance that takes place largely at a summer resort (a sort of precursor to Dirty Dancing). Gene plays Noel Airman, the social director for the camp, who woos a naïve, young Natalie with his song “A Very Special Love.” Read up on the other similarities and differences between MM and DD here. Finally, Gene acts alongside Spencer Tracy and Fredric March in Inherit the Wind. The plot is based off of the famous Scopes “Monkey” Trial, in which a schoolteacher is accused of promoting the theory of evolution. 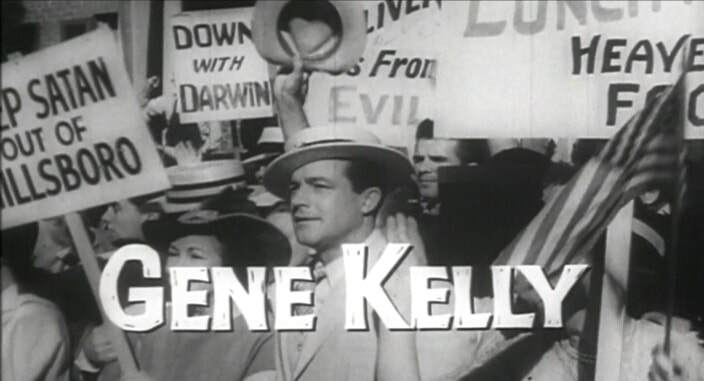 Gene’s character, E.K. Hornbeck, is the cynical newspaperman who is drawn to the town to report on the trial, as well as the antics of the townspeople.